Yesterday, I spent the day working in a coffee shop in Brooklyn, whipping up some meshes. These meshes are part of a modular set that can be pieced together into buildings (walls, roofs, columns, etc.). For the demo that I'm submitting to festivals, I plan on starting the player in a building that uses this set. 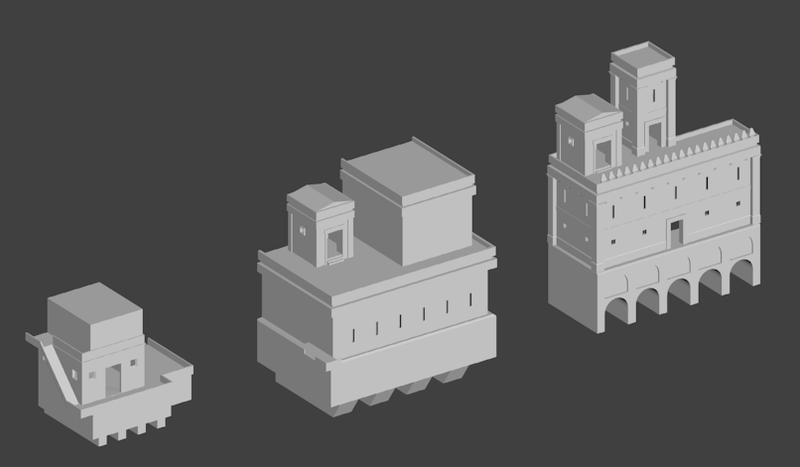 For now, I'm calling these assets the "outpost" set, since this initial building is rather remote from civilization. In the first image below, you can see my inital 3D sketch, a few grey boxes lumped together with some indication of a doorway. I was originally planning a three-level shanty. The middle building is my second attempt at a sketch. At this point, I had decided to make the building look more like a tower or castle, with arrow slots, two-story-tall walls, and thick entablatures. I then set about using this sketch as the basis for the modular components. I took these components, which are arranged in the second picture, and assembled them into the building in the top picture on the right. I also decided to add kite-shaped crenels to the set, just to make it look cool. Keep in mind that this is a very rough first pass at a mesh set. As stated in my last post, I will just do a box unwrap on these meshes and assign them multiple textures each. This is not the most efficient way of modeling/texturing, since it increases draw calls. The alternative is to use texture atlases, which I really, really hate generating and takes up a ton of time. Also, creating buildings out of small modular components can potentially slow the load times for the particular chunk that they are located in, since there are more objects in a location. 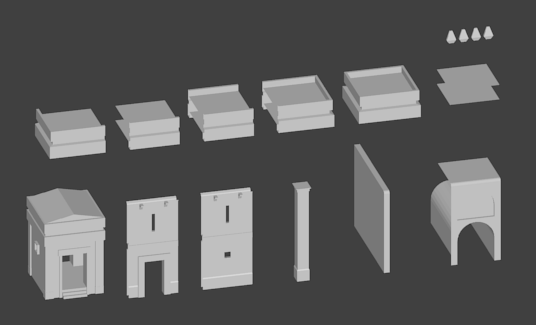 On the plus side, the modular set means that I can easily create buildings of many shapes and sizes. I haven't decided the color set just yet, but I am leaning towards white walls and red detailing. The whole thing looks more like a mini palace than a military outpost, so I may be adding some components such as wooden scaffolds, cranes, and lookout turrets to make it a bit more utilitarian. The whole game will feature rather blocky and minimalistic structures like this one, keeping with the stark aesthetic of the world while also operating within my capabilities as a modeler. The next step will be to create the interiors, doors, platforms, support brackets, details, and materials. Looks great! I like the style of these pieces – the bold lines in the architecture really look like they'd feel right at home against the wall (boom, that's the title). Keep it up!